RIDM 2016: Sundance Now has got a deal for you! 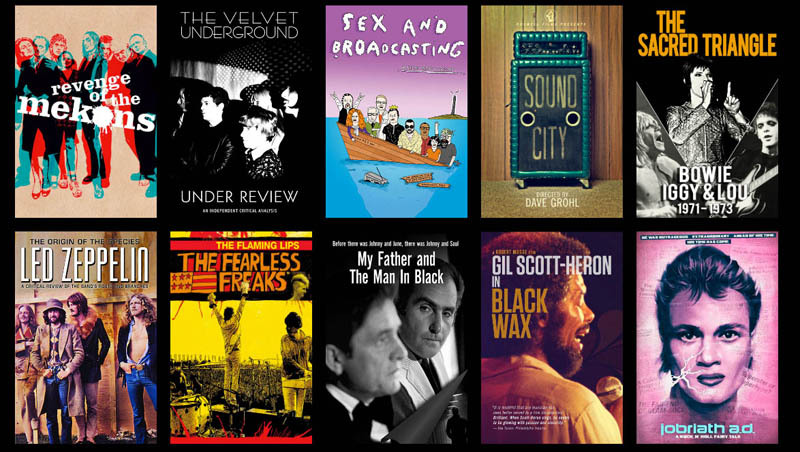 Here are just a few of the music documentaries available from Sundance Now. Going to Montreal’s documentary film festival RIDM today? It’s the festival’s last day for this year. If you go, consider having a chat with the people from Sundance Now. They have tables at all or most of the RIDM locations. While it doesn’t have as many films as Netflix does, (not yet anyway) once a film is added to the Sundance Now collection, it remains in it – it isn’t deleted a few weeks or months later. That’s a plus, right? If you don’t like the service, just cancel it before the 37 days are up. Xiaobin is a young woman of 17 who moves from China to Buenos Aires to join her parents. Signing up for Spanish lessons allows her to make friends, expand her horizons and contemplate many possible futures. Each student in the class is given a Spanish name (she gets Beatriz). They can play at new identities – a nurse from Barcelona, a business woman from Colombia, a lawyer from Montevideo. They practice mildly stilted dialogue exercises, inviting each other to meals or to the movies. Outside the classroom, Xiaobin uses those phrases when talking to Vijay, an immigrant programmer from India, and they really do go places together. They still act like they’re practicing, though. They order orange juice, and then decide to leave a few minutes later without even tasting it. “Should we go? “Let’s go.” The audience in the cinema laughs. After the film, a friend said that the person who played Vijay was not a good actor. I’m not sure about that. I think he might have played his part exactly the way director Nele Wohlatz wanted him to. The dialogues in their text books will sound familiar to anyone who’s ever taken a language class, but some of the overwrought things Vijay says sound like they’re from a melodramatic telenovela. Kitty content: After a few dialogues about cats, kittens start to appear in the homes of some of the students. El Futuro Perfecto is not a typical documentary at all. It’s some sort of hybrid thing – drama/documentary/improv, based on the real-life experience of star Zhang Xiaobin. Many parts are quite funny, too. I would have been happy to spend more time in the world of El Futuro Perfecto, but it’s only 65 minutes long. Maybe writer/director Wohlatz and her cast said every thing that they wanted to say within that time frame. If so, kudos to them for not dragging things out. Learn more about El Futuro Perfecto or buy tickets on the web site of RIDM, Montreal’s documentary film festival. El Futuro Perfecto, 65 minutes long, in Spanish and Mandarin with English subtitles. Sunday, Nov. 20 at 2:30 p.m., Cinémathèque Québécoise, Salle Principale, 335 de Maisonneuve Blvd E.
Caffeine and music! Two of life’s essentials. 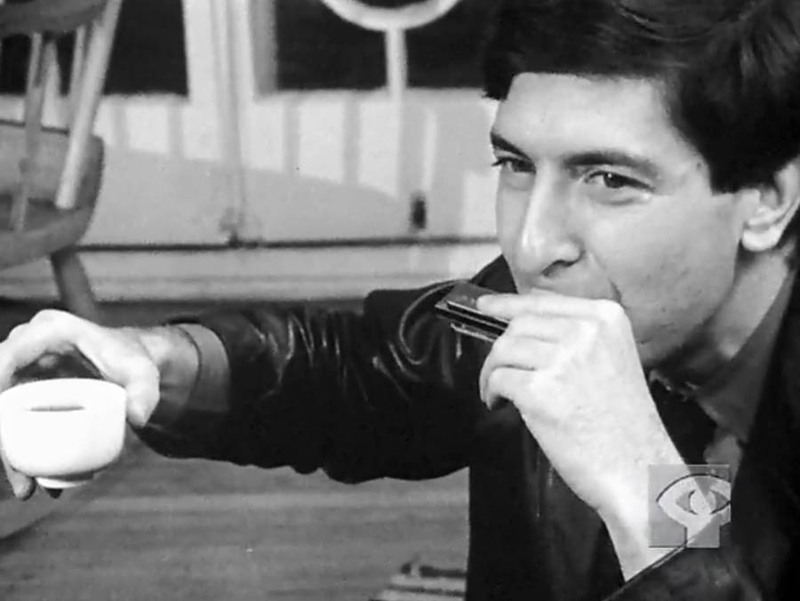 Leonard Cohen with coffee and a harmonica, in a shot from the 1965 NFB documentary film, Ladies and Gentlemen. . .Mr. Leonard Cohen. Tonight, Friday, Nov. 18, 2016, at 7 p.m., RIDM, Montreal’s documentary film festival, in association with with the National Film Board of Canada (NFB/ONF), will present a free screening of the 1965 NFB documentary, Ladies and Gentlemen… Mr. Leonard Cohen by Donald Brittain and Don Owen. The film will be shown, free of charge, at RIDM Headquarters (3450, St. Urbain St., near the corner Sherbrooke St.). “A limited number of seats will be available,” (because the rooms are not huge!) The atmosphere will be very special, I’m sure! 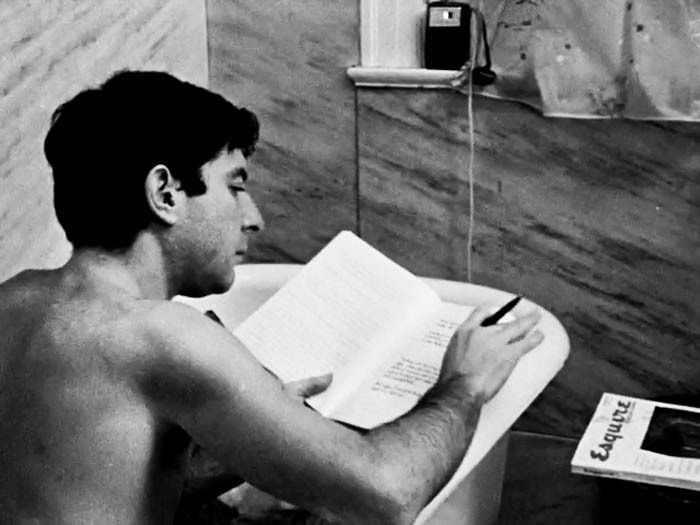 Leonard Cohen in his bath tub. Notice the Esquire magazine. Product placement? What’s that on the window ledge? Could it be. . .a transistor radio? Ask an old person. An image from the documentary The Great Wall, whch is being shown at the 2016 RIDM documentary film festival in Montreal. For me, the curves of this fence suggest the dragon-like undulations of The Great Wall of China. The short story’s nameless narrator is someone who worked on the wall himself, thouands of years ago; he muses about why it was built the way it was – in many unconnected pieces of 1,000 metres each, with great gaps in between. He declares that it was dysfunctional and the authorities must have known that, so they must have intended it to be dysfunctional. . .but again, why? The film’s narrator, Nicola Creighton, reads excerpts from Kafka, in the original German, while we look at walls and very tall fences marking borders in Europe and North Africa. Those North African scenes were shot in Melilla, a small chunk of Morocco that Spain has held on to since 1497. Because I had read the story recently, I caught a change that had been made to Kafka’s words. He wrote: “Against whom was the great wall to provide protection? Against the people of the north.” The film narration says “people of the south.” This north-south change occurs several times in the narration. Walls and fences alone are not enough to keep the “others” out. There are watchers in the sky, in airplanes, surveillance cameras with night vision, and the kind of towers you see in films about prisons and concentration camps. Often, it is not clear where we are in the world, though palm trees hint at a hot climate. Is that because one border often looks like another? Is it because some refugees/migrants don’t always know where they are, either? Should we think of it as a metaphor, more than anything? Sometimes, the forces of law and order give us a clue: what does it say on the back of their uniforms? POLICE, POLIZEI or GUARDIA CIVIL? In Greece, their shields say POLICE, but there is another word writen in Greek alphabet. There are scenes of huge skyscrapers in big cities, with pedestrians in suits walking around looking powerful and purposeful. My thought about that was, those buildings are another kind of wall or border, that will succeed in keeping strangers out. It’s likely that few migrants will be able to enter them, except perhaps as cleaners. The music in the film gives an air of menace to many scenes. On the other hand, we often hear birds singing. My interpretation of that: birds are almost everywhere, they sing on good days and bad, they can go to any place that the wind and their wings will take them, unlike humans, they know no borders. Coincidence: This was the second time this week that I have seen Maersk shipping lines onscreen. The other time was in a documentary about the “boat people” who fled Vietnam 40 years ago. Some of them were rescued by a Maersk ship. At 72 minutes, The Great Wall felt a bit longer than it is. Some viewers might find their interest flagging toward the end. Or not. I’m not sorry that I went. There’s lots of food for thought in the film. The Great Wall, 2015, from Ireland. The Great Wall is being shown as part of RIDM, Montreal’s Documentary film festival. See it at 8:30 pm, Friday, Nov. 18, at Cinéma du Parc, 3575 Ave du Parc. You can read more about it, and buy tickets on the RIDM web site. The trailer below looks very dark. Most of the scenes in the film are not like that. 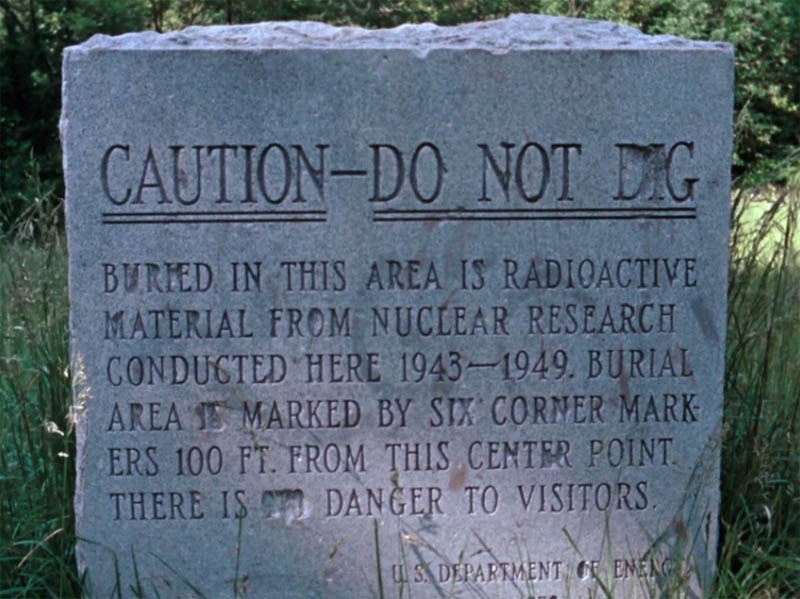 An image from Deborah Stratman’s film The Illinois Parables. The documentary is being shown at Montreal’s RIDM film festival. RIDM (Rencontres Internationales Du Documentaire De Montréal) is Montreal’s documentary film festival. It runs from Nov. 10 until Nov. 20, 2016. The festival’s (English) home page is ridm.qc.ca/en. Here are my three suggestions for tonight, Friday, Nov. 11, based on the descriptions in the festival’s catalogue and reviews from the Internet. I have not seen these films yet myself, but I intend to. The Illinois Parables will only be shown once, so it’s now or never! There are other positive reviews for The Illinois Parables out there, I’ve just chosen to link to these two. The Illinois Parables is 60 minutes long. Friday, Nov. 11, 19/7 p.m.
An image from the documentary film INAATE/SE/ [it shines a certain way. to a certain place./it flies.falls./]. The film is being shown at the RIDM film festival in Montreal. INAATE/SE/ [it shines a certain way. to a certain place./it flies.falls./]. INAATE/SE/ [it shines a certain way. to a certain place./it flies.falls./]. : 9 pm, Salle JA de Seve, Concordia University. An image from David Lynch: The Art Life. The documentary is being shown at Montreal’s RIDM film festival. David Lynch: The Art Life: 9:30 p.m. at Concordia University, Friday Nov. 11 and Sunday, Nov. 13 at 8:30 p.m, at Cinematheque Quebecoise. 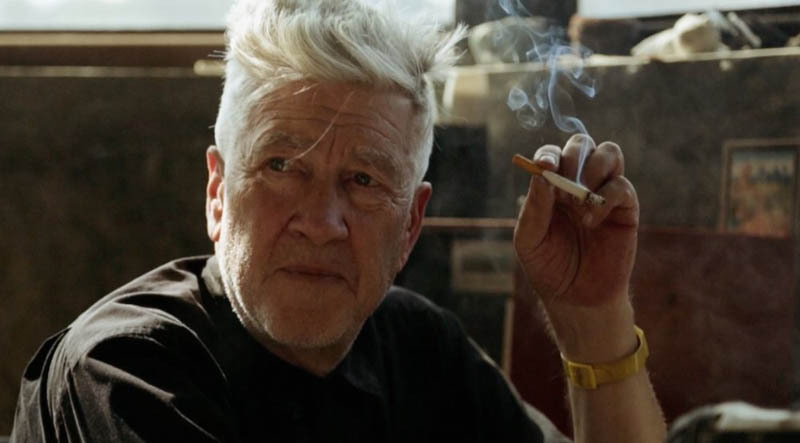 David Lynch: The Art Life: 9:30 p.m. in the Hall Building at Concordia University.